The Twin Solar Cell, unlike common flat photovoltaic cells, is characterized by its longitudinal (i. e. wire-like) cell elements which can be arranged in nearly every conceivable shape and size. Producing Twin Solar Cells is simple. They consist of silicon coated steel wire or copper-indium-diselenide coated copper wire. The metal wires operate as internal electrodes and carry p-n or n-p layers. Areas of application: tile like panels on roofs, along or above country roads, motorways, railways, and agricultural and urban fencing etc. As of today, the Twin Solar Cell is available in samples only. Extensive laboratory measurings and calculations have been conducted and documented. Provided the photovoltaic properties of plastics can be exploited for the production of solar cells, it would also be possible to develop photovoltaic textiles (i. e. "solar blankets", truck hoods, indoor and outdoor curtains, special clothing). 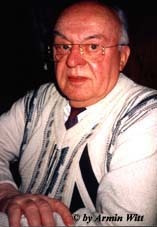 Dr. Helmut Hoegl was born in Germany in 1926. He is a diplomaed chemist and a renowned inventor (was awarded the Diesel medal for inventors in silver in 1990). In the late fifties, Dr. Hoegl discovered the photovoltaic properties of polymers and, while working for Kalle Co. (Wiesbaden, Germany), invented the photovoltaic substance that today is used in virtually every copying machine and laser printer. Thereafter, Dr. Hoegl joined and later headed the Battelle Institute in Geneva until 1976. His projects include the development of catalysts for the production of polyoleofins and highly sensitive organic synthetic conductors and the development of new synthetic films for use in cars, office supply products, private households and construction site equipment. Since the eighties, Dr. Hoegl has also been conducting research as a free scientist on the "Elfino Theory" (dealing with the nature of energy) and "Monetary Energetics" (energy as a measure of cash value). The Twin Solar Cell was invented in 1985. It has been patented in the US, in Japan, and in Germany. The patent for the European Union is pending.